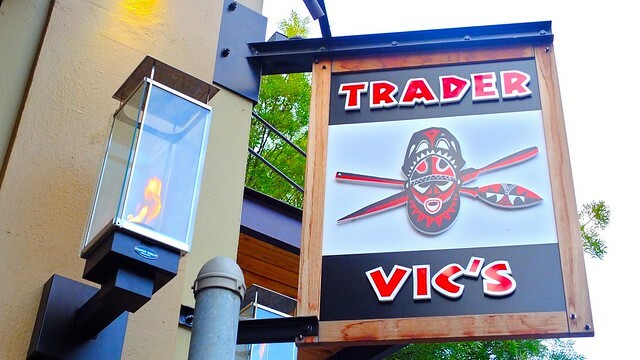 2 Days in Portland: Cocktails at Trader Vic's Tiki bar in the Pearl District on August 27, 2012. 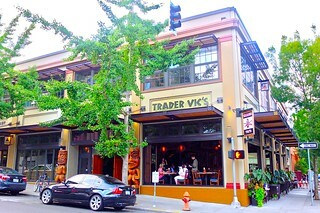 Our groom Chris wanted to try the home of the original mai tai so we visited Trader Vic's for some tropical libations. 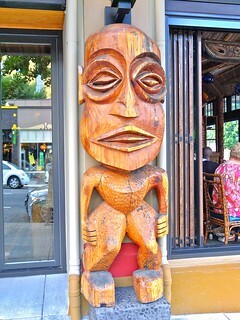 The Tiki bar was massive with an interesting Polynesian inspired decor in the lounge, dining area, hall, and bar. We drank the 1984 mai tai (middle), mango tai (right), and mai tai board sampler with three mini mai tais of different flavours. All were fairly good and refreshing. 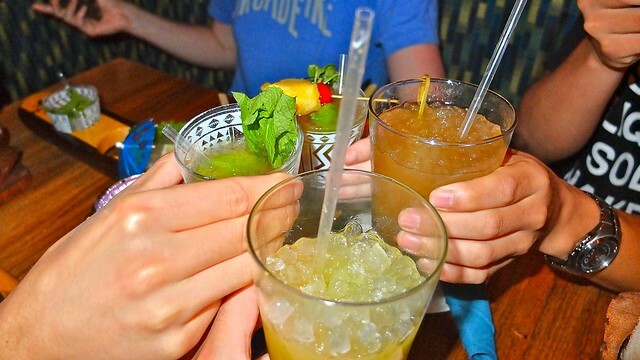 There were a few communal, sharing drinks. 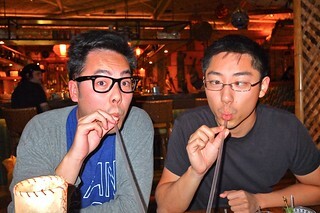 Chris asked, "What is the most hilarious drink to share?" 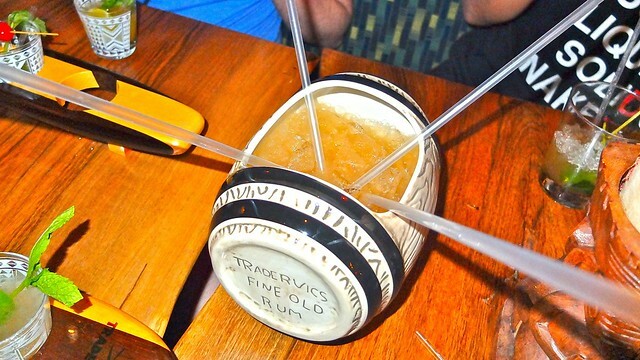 Our server quickly exclaimed it was definitely the rum keg. 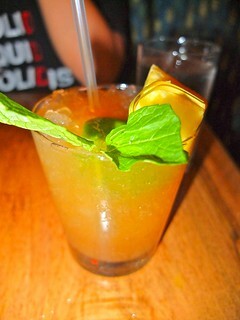 So we all sipped on a small keg filled with rum and fruit juices from extra long straws. Very hilarious and refreshing indeed. 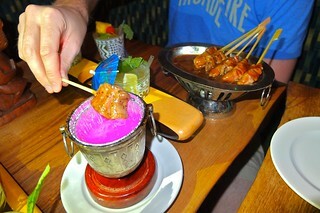 Chris also tried the beef cho-cho (below) with seared steak in soy sake sauce using his own flaming hibachi. 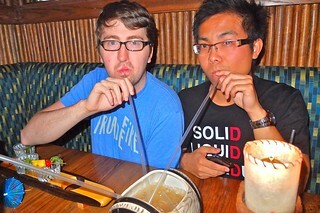 We stayed at Trader Vic's for hours, enjoying the massive lounge and Tiki environment. It's gimmicky yet fun place for a drink (or several). Great post. 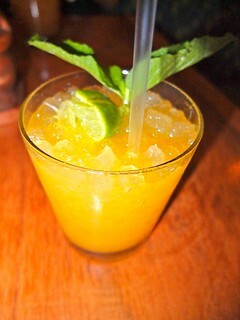 But you should know the Mai Tai was invented by Trader Vic in 1944 (not 1984). There's a grand tradition behind it all.